In our previous articles we seen the variable declaration, initialization and, they are pretty good for initializing few variables. What if we want to store 100 employees salary? Is it worth to create 100 variables and assign those values, What happen if it is 150 employees. In order to handle these type of situation, Java Programming language introduced the concept of arrays. In this article we will show you, How to declare Java array, creating java array, initialization and accessing java array elements. An Array in Java is a container objects that holds a collection of similar type of elements (type may be integer, float, long etc). It means, we can’t store multiple data type values. For example, an integer array in Java will store all the integer elements, if you try to insert a float or char value then it will throw an error. Array_Size: Number of elements an array can hold or store. For example, Array_Size =10 then array will hold 10 values. Here, we used int as the data type to declare an array. So, above array will accept only integers. If you try to add float values then it will through an error. The size of an Array is 10 it means, Student_Marks array will only accept 10 integer values. If we try to store more than 10 then it will throw an error. We can store less than 10. For Example, If we store 3 integer values then remaining 2 values will be initialized to default value (Which is 0). Here, We did not mention the array size but the compiler is intelligent enough to calculate the size by checking the number of elements. Here we declared an anIntegerArray array of size 5 but we only assigned 3 values to it. In this situation, the remaining values will be assigned to default values (0 in this case). We can use the index position to access the elements of an Array in Java. Using index we can access or alter/change each and every individual element present in an array. Index value starts at 0 and end at n-1 where n is the size of an array (or Length of an array). In this Java array program, We will declare an integer array of size 10 and then we will sum those 10 values and displays the output. 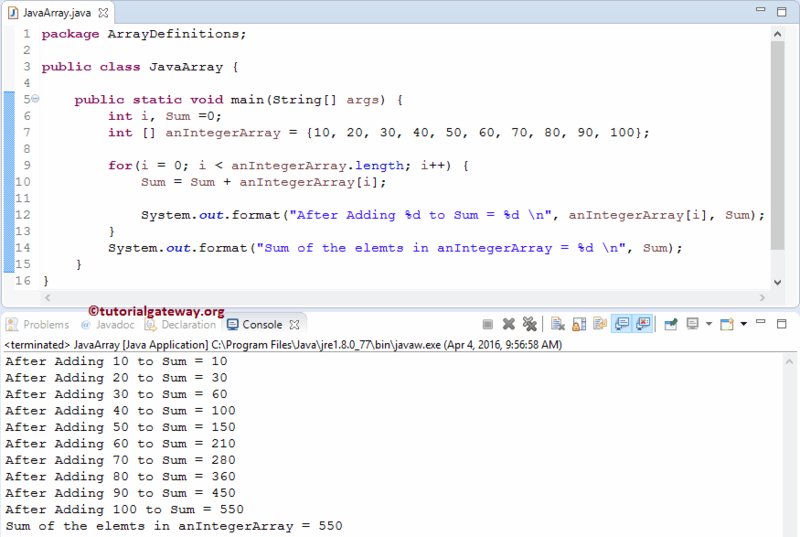 Below For loop will help to iterate each and every cell present in the anIntegerArray array. Condition inside the for loops (i < anIntegerArray.length) will ensure the compiler, not to exceed the array limit. Sum = Sum + anIntegerArray[i]; statement is used to add each and individual array element present in the anIntegerArray to Sum variable. System.out.format statement will display the Sum value after every iteration. TIP: anIntegerArray.length is used to find the length of an array. The value of i will be 0 and the condition (i < 10) is True. So, it will start executing the statements inside the loop. The value of i is 3 and the condition (3 < 5) is True. The value of i is 4 and the condition (4 < 10) is True. The value of i is 5 and the condition (5 < 10) is True. After increment, i is 6 and the condition (6 < 10) is True. The value of i is 7 and the condition (7 < 10) is True. i is 8 and the condition (8 < 10) is True. i is 9 and the condition (9 < 10) is True.